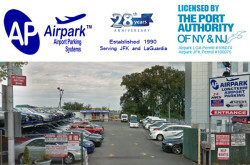 - AirPark Laguardia Airport Long Term Queens NY. Airpark LGA parking lot near LaGuardia airport. Driving to LGA and parking with Airpark LaGuardia is much easier and less expensive. Offering outdoor long term parking, valet parking, and high levels of customer services. Located approx. 4 minutes (1.2 miles) from the LaGuardia Airport Queens New York. - Licensed by the port authority of NY. 99-11 Ditmars Blvd., East Elmhurst, NY 11369, USA. 100-15 Ditmars Blvd, East Elmhurst, NY 11369, USA.